I recall that several years ago that Heartland had asked if i could be listed as an expert in the issue of hurricanes and climate variability and change. I haven't had any direct interaction with Heartland in any other capacity. Now as bunnies with far too little to do know, there has been a somewhat ill tempered dust up between Eli's friend Roger Pielke Jr, and Eli's friend Joe Romm whether Roger was simply an expert acknowledged on its web page by Heartland without Roger having any other connection with Heartland or a Heartland Expert. Albatross, to give due credit, set it off. This is, indeed, one of those Schleswig Holstein Succession problems which will be debated long after those involved are buried and the continuing cause of wars. But wait, there is more, somebunny whispers in Eli's ear that the archived 2009 version of the Heartland blurb for Heartland Expert Roger Pielke Jr. had the same text, clearly about RP Jr, but had a picture of RP Sr. Is it possible that dad got the letter from Heartland, and that Heartland mixed up the RPs?? Is Heartland the gang that couldn't get its Pielkes straight? If the Lord has a sense of humor, please, oh please. . . .
Well color me stoopid, that is why they call me stoopid. But from BCL, Dennis Avery of Hudson Institute, Sr. Fellow of Heartland, frequent author / quotee in Heartland E&CN (see Fake science... p.89) ... has remained steadfast. Benny Peiser seems to have delisted without comment. I wonder if he mentioned that to Sonja or The Viscount, or Richard Courtney, all global warming experts. That schedule contains just about every canard on the denialist bingo list. There'll have to be some serious cognitive partitioning occurring for the attendees to sit through the whole event and not suffer brain explosions from dissonance resulting from the melding of mutually-contradictory notions. the small comment Dr. Landsea made here is nothing close to the criticism he leveled at the IPCC and Dr. Trenberth. "I now thoroughly regret having agreed to their [Heartland's] request. I am horrified that my name should be associated with such a distasteful, revolting campaign. To me it is worthy of the worst propaganda of the 20th century. In summary, I am horrified that you should have found my name in association with this sort of claim. I copy this message to Mr Joseph Bast and demand that my name be removed from any mention by the Heartland Institute." That's worse than anything Reiter ever said about the IPCC, I'm sure. An interesting "Global Warming Expert" is Davgid Tuerck, or archived, just in case. He was on the 2009 list sent out to legislators, the one that I think Eli referenced that had a picture of RPS,Sr attached to a description of RPS, Jr.
- Chairs the Economics Department @ Suffolk University in Boston. - Runs the Beacon Hill Institute (BHI) @ Suffolk U.
I'm not sure where most of the money comes from, but L&H Bradley and Roe give some, both on my usual lists. Also, DONORS TRUST has funded them, so I don't know who that really was. - Tuerck has spoken at Heartland ICCC-s 1,3, 4, 6 ... so it's not like he should be surprised. By odd coincidence, he was in WSJ today on "carried interest." - BHI is a Silver Cosponsor for the upcoming ICCC-7. But there is one new Gold Sponsor that people will just love. John, who is it? I can't find old sponsor lists to compare with. Hang on, is Ayn Rand spinning in her grave? It's the big, bold black-and-white one ... added *after* the billboard episode. Recall from the 2012 Heartland fundraising document that Murray Energy gave HI $100K in 2010, and they expected $40K in 2012. Murray isn't directly a member, but these are, including The American Coal Company, which is a subsidiary. Well color me stoopid, that is why they call me "Hey Stoopid". Thanks, 'john' for your breaking news. Do I detect a ringer "PhD", on this list of tentative speakers at the "HI" Denial-a-Palooza conference, on page 3? "is a well-known independent climate researcher, posting regularly on two science blogs, ClimateAudit and Watts Up With That. His climate work has been cited in newspapers around the world, including The New York Times, the Guardian, the Australian Herald-Sun, and the London Telegraph." Hmmm, no peer reviewed science journals on that list provided. I never knew "The Guardian Newspaper, considered itself as a peer review science journal either? I couldn't resist, turned the comments into a longer post on Coal sponsorship of climate conference. Of course sponsorhip by Peabody, Arch, Murray Energy is a good thing. I'm hoping they invite John O'Sullivan OBE and John O'Sullivan the Irish barrister from Cork. They might enliven any presentation by Heartland regular John O'Sullivan of Fighting the Green Dragon fame, as both want a word with the latter about identity theft, as his blurb notwithstanding , Heartland's J.O'S is neither the former editor of National Review, nor a member of the Irish Bar. This wouldn't be the first time that Heartland couldn't keep its experts straight. Remember Richard S. Courtney (the guy who claimed he had a degree from "Cambridge," but had nothing of the sort, certainly not from the real thing)? Well, Heartland listed a web site for one Richard Courtney, which turned out to be a COMPLETELY DIFFERENT Richard Courtney with a really-o truly-o academic job and real credentials (and a thoroughly nice guy doing worthy stuff), whose name got tarred by a completely involuntary association with Heartland. I have no idea whether Heartland ever fixed this, or for that matter cares which Courtney they have, with or without dubious CV's. He thought Eli was talking about "Postergate", but the Courtney thing sounds more like "Impostergate"
> Willard, we have come to a parting of the ways, and none too soon. I will not be responding to any more of your comments. > My first instinct two and a half years ago was to confront lies in the same forum they were uttered. And at the beginning I tried to be far more polite about it than I am now. But there are too many blogs, too many Marlowe Johnsons Nevens, dhogazas, Secular Animists, willards, Michael Tobises, ad nauseum. This is comment #1 on Junior's post where we learn what he learn this week. What I learn this week is that appealing to "reason, honor or dignity" can mean different things to different people, but that all these people do know that reason, honor, and dignity matter. Well, well, Pielke Jr. is not only breaking a promise and disingenuous, he is also duplicitous. That post about "what I learned this week" would be quite funny if it were not for the fact that he seems to be quite serious. but then again, maybe that is what makes it funny. Who knows, who cares? 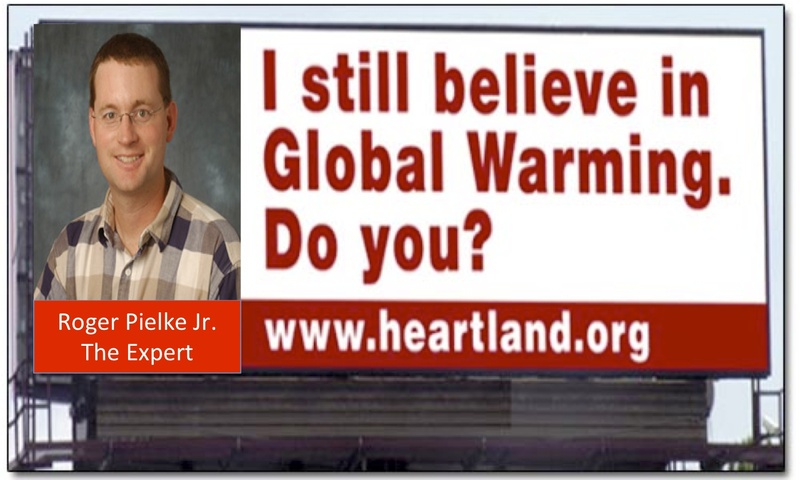 Someone needs to change that Heartland Billboard to say "Roger Pielke Junior is a liar". It is very annoying when disingenuous and duplicitous people like Roger Junior have the insolence and audacity try to claim to hold the moral high ground. Well, besides the new Gold Sponosor, Big Coal, added a week *after* the billboard, the next tidbit arrives. You can even read the first chapter free of the long unawaited Heartland book Roosters of the apocalypse. That was $6K in the 2012 budget, although they did cancel the Roosters polybags for E&CN. Too bad, the legislators who get this sent to them might have had fun. > Pielke Jr. is not only breaking a promise and disingenuous, he is also duplicitous. Please refresh my memory, Annoyed Bunny. That even goes a step further than Bast's latest, calling Mann et al 'madmen'. You really, really know that they know they've lost the fact based argument when you look at that. "No Eli and Dano, the bunny is crestfallen"
Since Fuller despises anyone who tells the truth and calls him out on his lies, you should be crestfallen! You need to quit nibbling the carrots he offers and chomp down with enthusiasm, that's all! Alan Caruba, a contributor to Heartland's E&CN and founder of the National Anxiety Center, which as far as I can tell, his is website. That has the original of "Climate Nazis." He is also an advisor to Sovereignty International. See Fake science, fakexperts, ... and do a full search on Caruba. Somehow, I suspect he may not wish to be removed from the fakexpert list. The portmanteau word "fauxpert" has some usage precedence and means exactly what you might think it means. but adds a syllable (or might) to the other two. Finally, more Americans quickly grasp fake than faux and know how to pronounce it. Some might pronounce it Fox, which could cause confusion. "The Heartland Institute, for whom I am a senior fellow, did not seek my input prior to its decision to put up its Ted Kaczynski billboard. Had I been aware of the plans, I would have argued strongly against it." Now, Taylor blogs at Forbes, is E-i-C of Heartland's Environment and Climate News and writes more articles for that than anyone else. Do a full search for Taylor in Fake... (or faux if you like). You can easily get an idea what a nice guy Taylor is, from the numerous excerpts from E&CN. Alternatively, search for "IRS-3E", the code for using inflammatory or disparaging terms, p.8. Bast apparently didn't ask the Board, nor Taylor. Who else might he have talked to? As Brian found earlier, he was using this Unabomber theme back in 2006. In fact, none of this current foolishness is particularly new, HI has been doing this for many years ... just not so obviously. The fall out from the billboard debacle continues all the way up to the very board of "Heartless Institute", or so it would seem. The Guardian May 20th, 2012: "Heartland Institute facing uncertain future as staff depart and cash dries up"
The down side "American Legislative Exchange Council (ALEC)", is still fully active and a formal complaint has been lodged with the IRS too. Details aren't at all clear, but it's fun to post anyway. "Not so much accepting his sentiments, as being entertained by his presentation"
We need a probability distribution on what "less than" means here -- do they have almost as many readers willing to accept his sentiments as finding them amusing? But does the first group join in when the second group laughs, or do they glower and grind their teeth? 49-51 plus or minus 8? 18 plus or minus 18?